This 3 piece seasoning set is comprised of two shakers and a matching plate. Each shaker has been sculpted for a comfortable grip and almost effortless shaking while the plate holds each shaker in place for easy passing across the table or display on your kitchen counter. The enchanting pattern will be a never ending focal point in your kitchen. This stoneware is crafted with the famous white clay, indigenous to the region of Boleslawiec Poland, and sculpted with expertise and specialized skills, combined with the traditional hand stamp technique and brush work unique to their tradition. The souls of the artisans embody every hand crafted piece of Polish Stoneware. Crafted by Z.C. Boleslawiec, the original Polish Stoneware factory, it is presented to you by Pottery Avenue, the premier importer of only the finest Polish Stoneware whose mission is to enrich and inspire your life through Polish Stoneware and ensure the 750-year-old tradition is alive and thriving. A national treasure, Boleslawiec ceramics have been manufactured for centuries. Developed from natural ceramic clay that can be found near Boleslawiec at the Bobr and Kwisa rivers. According to historical sources, the first stoneware was made in medieval times and in the early 16th century, local potters formed guilds to ensure perfection. Zaklady Ceramiczne "BOLESLAWIEC" was founded by one of the original men with the first pattern dating back to 1759. 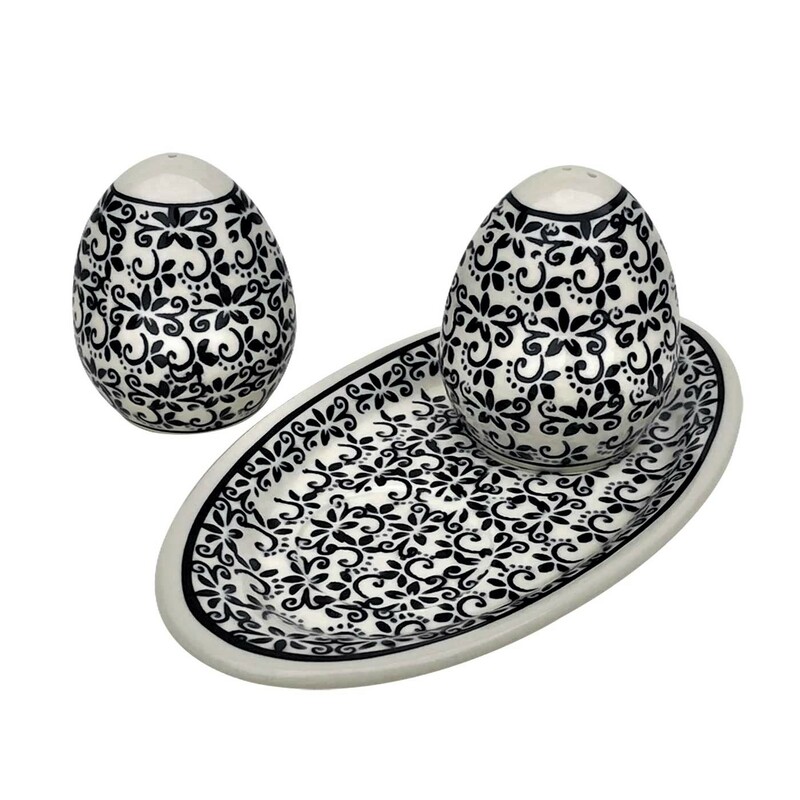 “ELEGANT TIMES SALT AND PEPPER WITH PLATE“ is a CLASSIC pattern based of the 300 year old pattern "EYE OF THE PEACOCK". Designed by top designer and imported by Pottery Avenue, the premier importer of Polish Pottery & Polish Stoneware.